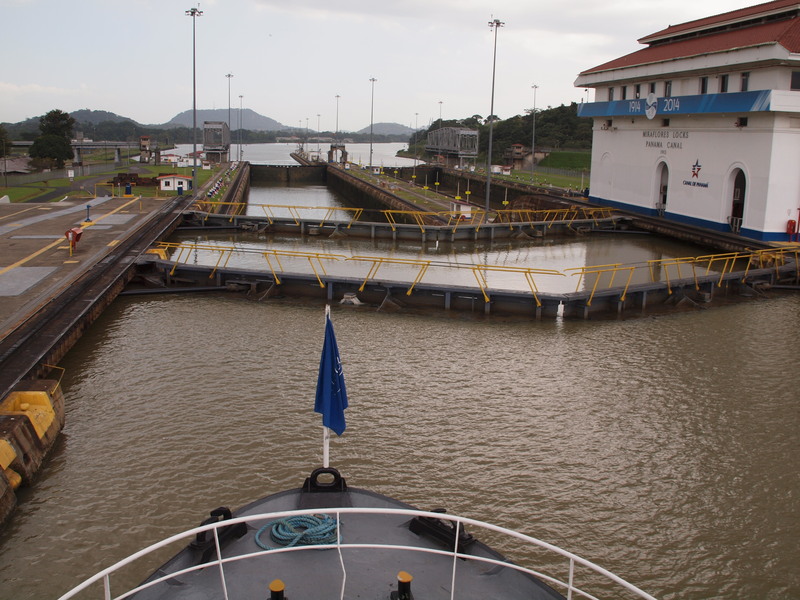 This year marks the centennial of the Panama Canal. With its opening in 1914, seagoing transit between the Atlantic and Pacific Oceans was radically transformed. Before “the trench” was dug, ships seeking to cross the Americas needed to circumnavigate South America — a time-consuming journey of 8,000 or so miles that included the rounding of that continent at the treacherous Cape Horn. The canal, however, is just 48.2 miles long and can be traversed in complete safety in 10 hours or less. It was a stupendous achievement, and in 1994 the American Society of Civil Engineers recognized it as one of the Seven Wonders of the Modern World. (The other works named to that list include the Channel Tunnel; the CN Tower; the Empire State Building; the Golden Gate Bridge; the Itaipu Dam; and the Netherlands North Sea Protection Work.) In November 2013, I experienced this modern wonder firsthand. From groundbreaking to completion, the creation of this engineering marvel took over three decades. It was initially undertaken by France in 1880, but the French efforts petered out in the 1890s. In 1903 Panama achieved independence from Colombia after a rebellion supported by the United States, and in 1904 the United States assumed control of the project to build the canal. 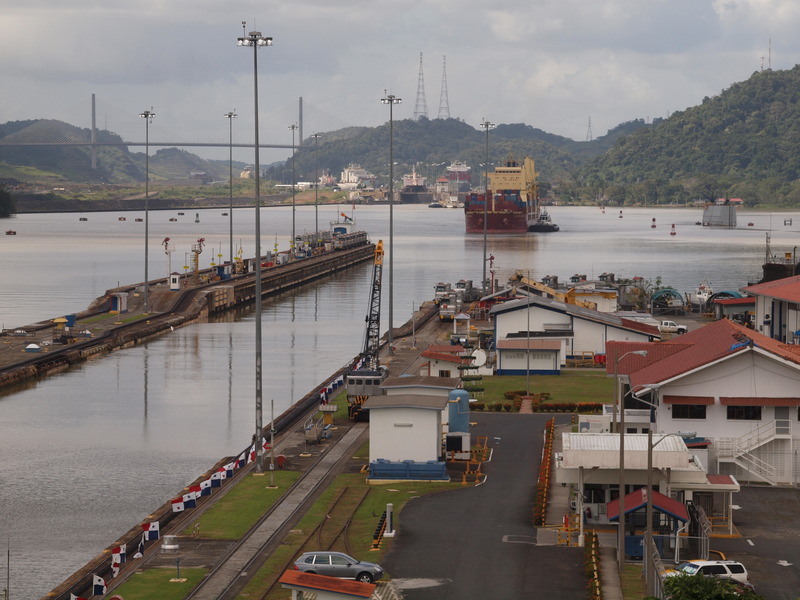 The U.S. formally took over the construction after entering into a treaty that also gave it control over the geographic area known as the Panama Canal Zone. (That Zone consists of the canal itself as well as land extending several miles from either side of it, but excludes the cities of Panama City and Colón. Pursuant to a subsequent treaty signed by U.S. President Jimmy Carter in 1977, the U.S. ceded the Panama Canal Zone back to the Republic of Panama effective January 1, 2000.) Construction of the canal was finally concluded in 1913, and it opened to maritime traffic in the following year. The creation of the canal proved costly, and not just monetarily. Tens of thousands of the workers on the project died while it was being built. For the vast majority of those fatalities, the cause of death was either malaria or yellow fever; those two diseases also resulted in the hospitalizations of additional tens of thousands of laborers. 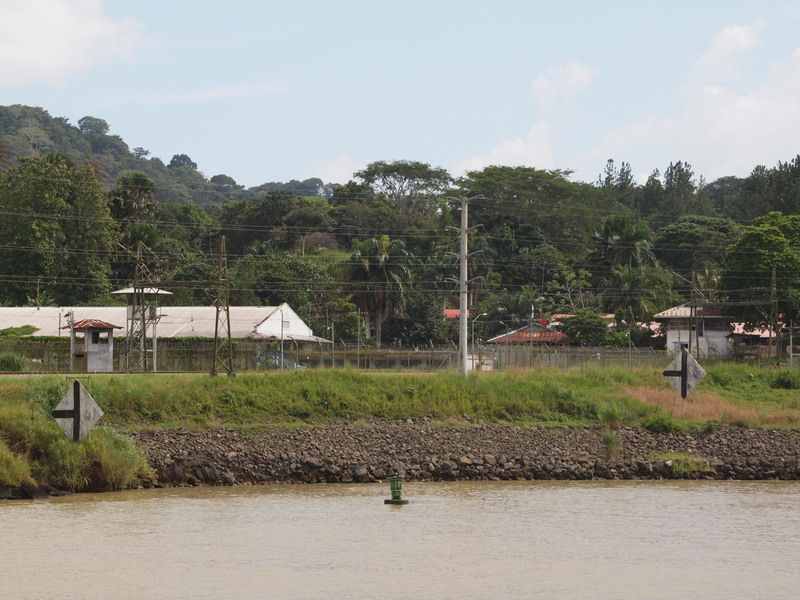 It was during the time period of the canal’s construction that mosquitoes were first identified as the transmitters of malaria and yellow fever, and by the time of the completion of the project, public health officials had made great strides in reducing the incidences of both diseases in Panama. My tour set off in the middle of the canal, and proceeded towards the Pacific Ocean. You may be surprised to learn that while the Pacific Ocean is generally located to the west of the Atlantic Ocean, the course of the canal from the Atlantic to the Pacific is a winding route that generally follows a southeasterly direction, rather than going from east to west. 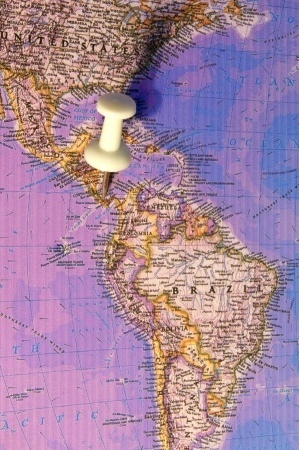 (This results from the east-west orientation of the Isthmus of Panama that the canal bisects.) 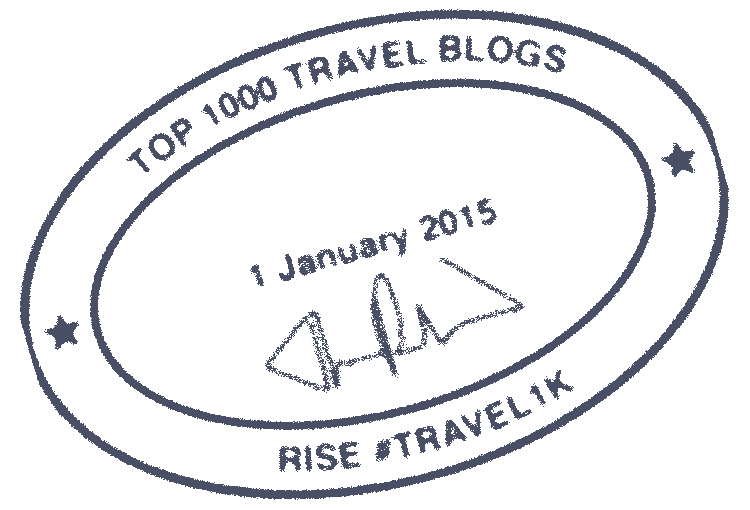 Conversely, Atlantic-bound vessels chart a northwesterly course through the canal. Orange is the new black for Manuel Noriega, who is one of the inmates in El Renacer Prison on the Panama Canal. We also passed by a colourful museum designed by legendary architect Frank Gehry. It’s called the Biodiversity Museum: Panama Bridge of Life, and is also known as the Biomuseo. 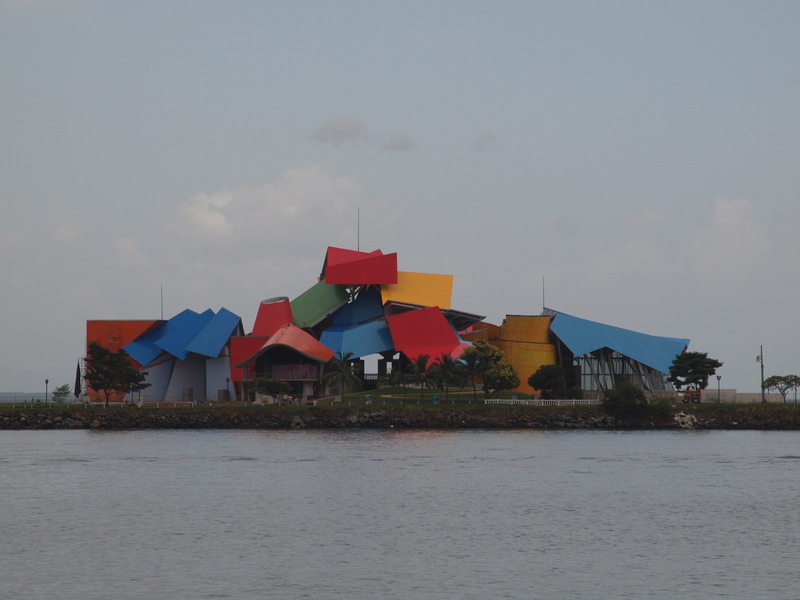 The Biodiversity Museum: Panama Bridge of Life (also called the Biomuseo), designed by Frank Gehry. The Biomuseo isn’t actually on the canal; it’s on a strip of land in Panama City called the Amador Causeway, which juts out into Panama Bay. We cruised past it after we’d already emerged from the Pacific Ocean terminus of the canal. At the heart of the canal are the locks. They work as follows: A vessel making its way through the canal doesn’t remain at sea level the entire way, because if the entire canal was at sea level, the resulting currents would be too dangerous. Rather, during the course of the journey, the ship is gradually lifted and then lowered. During the middle portion of its passage, as it sails through Gatun Lake (an artificial lake that’s one of the byproducts of the digging of the canal), the ship will be 85 feet above sea level. The locks are the means by which a ship is transferred between sections of the canal that are at different elevations. A lock contains a gated compartment that the ship enters. After the ship has entered the compartment, the gates behind it swing shut and are sealed. Depending on the direction in which the boat is heading, water is either pumped into the compartment, to raise the boat to a higher level; or emptied out of the compartment to allow the boat to descend to a lower level. Once the adjustment in water level has been made, the gates in front of the boat swing open and the boat can continue on its way. The canal’s locks contain two parallel shipping lanes, so they can handle traffic in both directions simultaneously. Additionally, an expansion project is underway that will add one more set of locks. The new locks will be wider and deeper than the lanes in the existing locks, and will therefore allow the canal to accommodate larger ships than are currently capable of fitting into its locks. They will also expand the overall capacity of the canal and allow more ships to use it. As of this writing, the third lane of the Panama Canal is expected to open in late 2015. 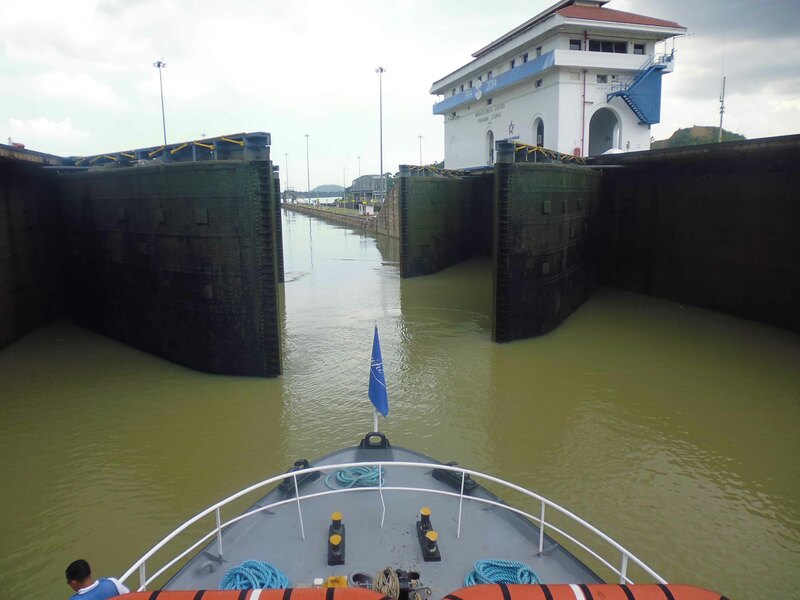 Immediately below are a couple of photos that I took from my boat as we went through the Miraflores Locks — a dual set of locks near the canal’s Pacific Ocean terminus. The view from my boat as we approach the Miraflores Locks. My view when we’re about to emerge from the Miraflores Locks, after my boat has been lowered. The Bridge of the Americas is one of two bridges that permit the crossing of the canal by automobile. This bridge is part of the Pan American Highway, an approximately 30,000 mile network of roads that extends from Alaska to Argentina (but which doesn’t connect North America with South America, due to a roughly 60 mile interruption called the Darién Gap that covers the border between Panama and Colombia). 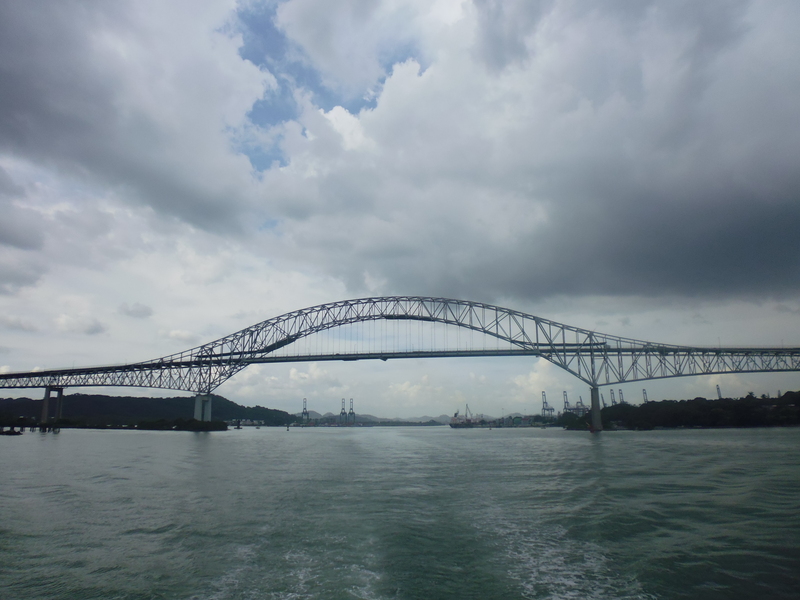 The view of the bridge seen here is looking away from the Pacific Ocean, after my boat had passed through the Miraflores Locks and ridden under the bridge. Also at the Miraflores Locks is a visitor’s center. Inside, you can learn more about the canal and how it works. It also contains observation decks from which you can look down upon the canal and watch vessels making their way through it. On the day after my cruise through the canal, I checked out the visitor’s center at Miraflores Locks. The next series of photos was taken from the topmost of its viewing platforms. Looking down on Miraflores Locks from the observation deck at the visitor’s center. As viewed from the visitor’s center, a Pacific-bound container ship approaches the Miraflores Locks. The container ship, with its colourful cargo, pulls into the Miraflores Locks. 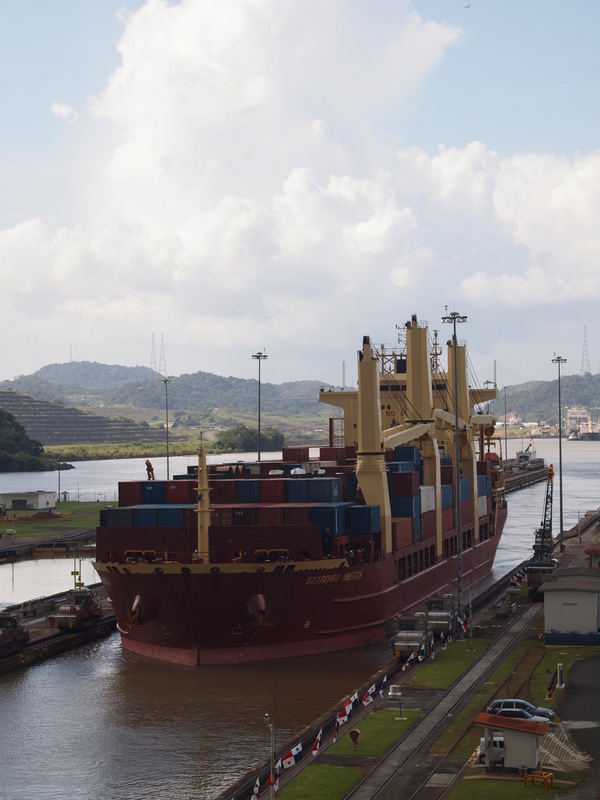 The container ship waits in one segment of the Miraflores Locks while the water level is lowered. In addition to the canal itself, I visited the Museo del Canal Interoceánico de Panamá (Panama Interoceanic Canal Museum) in Panama City. The museum provides a comprehensive overview of the construction and history of the canal. It’s in the Casco Viejo (Old City) section of town; and it occupies a historic building. 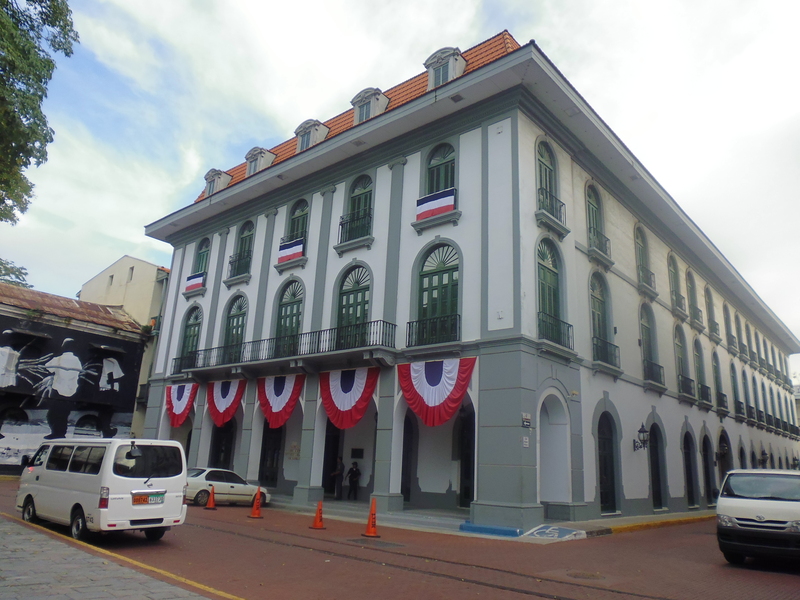 The Museo del Canal Interoceánico de Panamá (Panama Interoceanic Canal Museum) in Panama City. The museum is informative and displays some interesting artifacts related to the canal and its construction. The one drawback for English-speaking visitors (or at least those who aren’t fluent in Spanish) is that all the signage is in Spanish. You can rent an audio guide that provides English-language narration covering a portion of the museum’s exhibits, and much of what you’re seeing can otherwise be figured out from context. But I did feel that I wasn’t able to learn as much as I would have if English translations of the museum’s plaques had been provided. For example, the museum had a temporary exhibition on the discovery of the Pacific Ocean and the effects of that discovery on the Age of Exploration. The subject matter of that exhibition is fascinating to me, but I got very little out of the presentation due to the Spanish-only signage. (That temporary exhibition wasn’t covered by the audio guide.) Overall, though, I enjoyed my visit to the museum and felt that it enhanced my appreciation of the Panama Canal and my understanding of how it came to be. 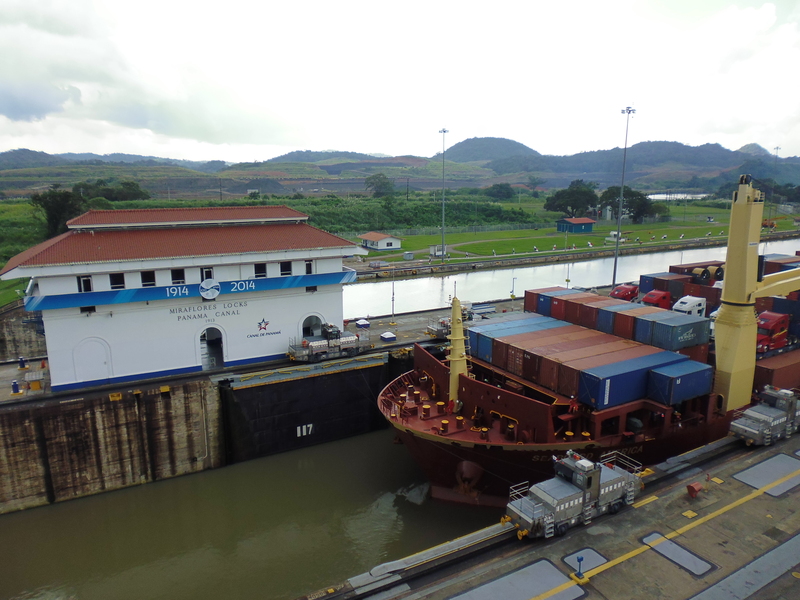 Would you like to ride through the Panama Canal? @codowd: I only saw one ocean that day, since I started in the middle of the canal. 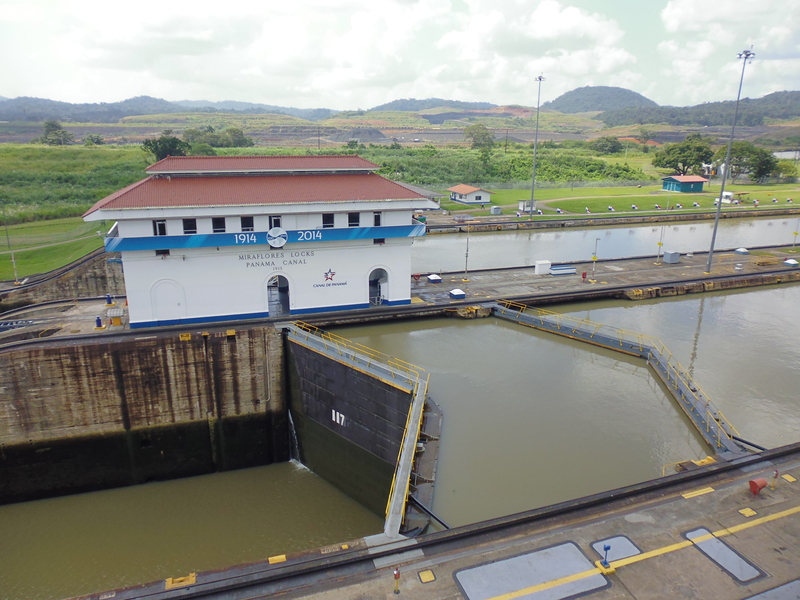 To be honest, even the partial tour involves a lot of sitting around (while you’re waiting for each of the locks to be ready for your boat, and then during the pumping process), so the full-day tour might have long intervals of boringness. 🙂 With that said, going through the canal was an amazing experience. You say that you’ve been obsessed with TWO canals; what’s the other one (besides Panama)? @Melody: I haven’t used that app. Sounds interesting, though. I was surprised at how large Panama City was. The whole experience sounds incredible! The Frank Gehry museum looks really amazing as well. I’m sure it doesn’t have my favorite mascots (Pee and Poop) from the museum in India that you visited, but the architecture is really incredible. This must have been an incredible experience. I saw the ferries going through the Miraflores locks, but actually going through it must have been ace! @Claudia: It really was a great experience! Amazing stuff, would love to visit. @Steven: You should! It’s great to see a wonder like this in person. One day, Senor, one day. Absolutely loved that you included a video. Although I’m sure it’s more amazing in person it allowed me to feel as though I were there. Thanks for all the wealth of information you provided. This is an amazing piece of history that I now know a lot more about! @thegetawaygal: I’m glad you enjoyed the video! Yes, the making of the canal is, in my opinion, a fascinating bit of history — and a great example of man triumphing over some great challenges! What a cool experience! I’ve never been through locks of any kind but at least I can say I’ve either seen or been through or across many of the other Modern Wonders. How cool is this! I’d love to see this in person! @MK: I hope you will get the chance to see it in person! I love the Biodiversity Museum building. I’d like to go inside, too. @Zofia: It’s certainly an interesting-looking building! @Ryan: Well, the U.S. did do all the work in getting the canal built after the French pulled out. 🙂 And if President Carter hadn’t signed the treaty in the 1970s, the U.S. might still have control of the Canal Zone today!